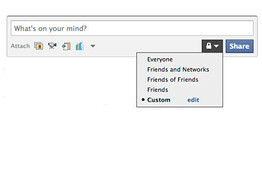 'What`s on your mind' goes public – Now share your facebook status message with anyone you like! ‘What`s on your mind’ goes public – Now share your facebook status message with anyone you like! In a few days, Facebook will roll out yet another new feature that lets you chose who do you want to share your status message with and whom you do not want to show your status messages. In other words, these are similar to the section wise privacy settings that already exist for Photo Galleries and Profile Updates. Not only this you can now chose to share your status updates, links and photo posts with people who are not even on Facebook. Check the image below. You can see the new privacy options on the Publisher Box (Read: What's on your mind Box).